There are three giant statues of Buddha from old Japan, but only the Big Buddha in Kamakura (15 meters) remains in original form. The Nara Daibutsu (15 meters) was recast, while the famous Kyoto Daibutsu (48 meters) was entirely destroyed in a fire and replaced by a small wooden substitute.The big statue Buddha (Daibutsu) in Kamakura was cast in 1252 and originally located inside a large temple hall. However, the temple buildings were washed away by a tsunami tidal wave in the end of the 15th century, and since then the Buddha stands in the open air. 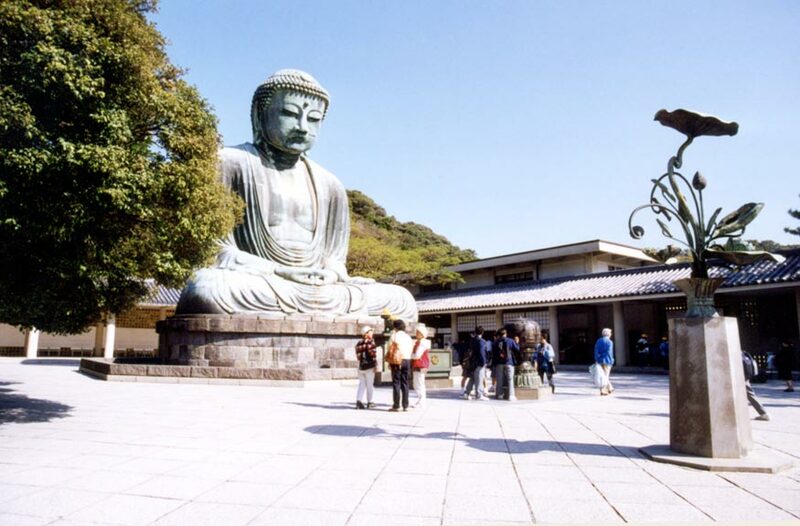 The Great Buddha of Kamakura, cast in bronze in 1252, weighs 93 tons with a height of nearly 44 ft.